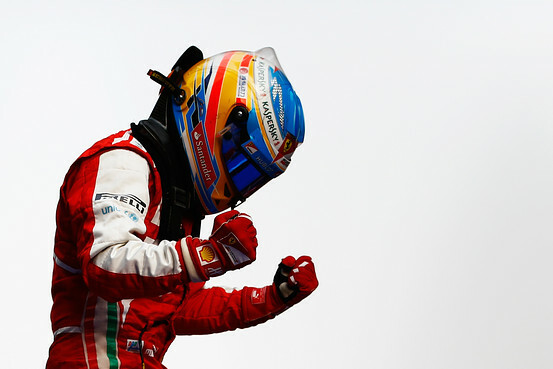 Getty Images Fernando Alonso of Spain and Ferrari celebrates after winning the Chinese Formula One Grand Prix in Shanghai on Sunday. SHANGHAI—Ferrari driver Fernando Alonso won the Formula One Chinese Grand Prix Sunday, claiming his and the team’s first win since last year’s race in Germany. Alonso took the lead for good with 13 laps to go and won by 10 seconds from Lotus’ Kimi Raikkonen, with pole sitter Lewis Hamilton of Mercedes finishing third, just two-tenths of a second ahead of Red Bull’s Sebastian Vettel. Vettel retains the championship lead, now just three points ahead of Raikkonen, with Alonso moving into third, ahead of Hamilton. In a race where tire strategy was crucial, the front three runners all used their strong early pace on the softer tire to establish an early advantage and all pitted inside six laps. While the likes of Vettel, McLaren’s Jenson Button and Sauber’s Nico Hulkenberg—who all started on the harder tire—profited initially by moving to the front of the field, the early leaders used fresher rubber to reclaim the advantage and fought out the latter half of the race.